Afghan security forces inspect damages after clashes between Taliban fighters and Afghan forces in Kandahar Airfield, Afghanistan, Wednesday, Dec. 9, 2015. A large-scale Taliban assault on a key airport in southern Afghanistan ended late Wednesday, according to Afghan officials, who said that the deal toll his risen to 50. The Afghan Defense Ministry said 38 civilians, 10 soldiers, and two policemen were killed in the attack, which began early Tuesday at the Kandahar Air Field. The last of the 11 Taliban militants involved in the attack was killed more than 24 hours after the assault got under way, the Thursday statement added. The heavily armed suicide bombers wearing uniforms of Afghan security forces stormed the airfield, which also houses a military base that includes NATO troops. There were no NATO casualties reported. Taliban spokesman Zabihullah Mujahid says its fighters entered the base and attacked local and foreign military personnel there. He claimed the assault left 150 soldiers dead, but the Islamist insurgency usually exaggerates casualty claims. The Taliban also released a photo of what it says are the 10 men in military uniforms it sent to attack the Kandahar airport. 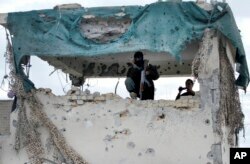 Afghan military officials say the insurgents began the assault from an area where residential buildings are located. Regional Corps commander General Daud Shah Wafadar, told VOA shortly after the attack that it started while he was going home from work. “I escaped unhurt, but a bodyguard was killed while another was wounded,” he said. Security forces swiftly engaged the assailants and killed four of them while the rest of the militants took up position in the nearby school, the general said. The attack underscored the ability of the Islamist insurgency to undertake high-profile attacks at will. Taliban attacks have intensified and expanded in Afghanistan this year in the absence of direct support from international combat troops who pulled out from the country last year. An Afghan security man stands guard at police station after clashes between the Afghan police and Taliban militants at a police station in the city of Kandahar, south of Kabul, Afghanistan, Tuesday, Dec. 8, 2015. The latest violence in one of the Taliban heartlands comes as Afghanistan’s near and far neighbors gathered in Pakistan to discuss further security and economic cooperation with the war-ravaged Afghan nation. Pakistani Prime Minister Nawaz Sharif, co-chairing the conference with Afghan President Ashraf Ghani, condemned the attack on Kandahar airport. “The prime minister paid rich tributes to the Afghan government for its efforts of eliminating terrorism... terrorism is the common enemy of both Afghanistan and Pakistan,” Sharif’s office quoted him as saying. On the sidelines of the Heart of Asia conference in Islamabad, Sharif and Ghani also held a bilateral meeting Wednesday to discuss ways to end violence in Afghanistan and start peace talks between Kabul and the Taliban. Afghan officials accuse Pakistan’s military of secretly helping the Taliban, charges Islamabad denies. At the conference, Larry Sampler of the U.S. State Department read out a statement by U.S. Deputy Secretary of State Antony Blinken that reiterated the search for a peaceful settlement through reconciliation talks in Afghanistan is of paramount importance in the wake of new emerging threats like the Islamic State in the country. “It is the surest way of achieving an end to the conflict and the full drawdown of U.S. and foreign troops in Afghanistan. No real victories can be won and sustained when Afghans are fighting Afghans,” said Sampler quoting Blinken.